My rating in words: LOVED this book! This book should be on everyone’s radar. Seriously. I ADORED it. It’s such a fun read in so many ways that I could keep raving about it forever. So why don’t I get started with that? We have a heteroromantic asexual main character. I repeat, we have ace representation. Romantic ace rep. GREAT romantic ace rep. Did I mention the fabulous ace rep? Because seriously, how many books are out there actually featuring ace characters? I could count them on one hand. And I wouldn’t even need all fingers… We definitely need more ace characters in literature. So yeah, I did highly enjoy the representation in Tash Hearts Tolstoy. Our main character, Tash, is a heteroromantic asexual, and though her sexuality is not the main focus of the book, it still plays a really big part of the story. She explains more about what it is and what the differences are between sexual and aesthetic attraction, the differences that there can be in how ace people experience their asexuality, the awkardness of coming out, the acephobia that she has to deal with and also the possibilities and difficulties of relationships between asexual and sexual people. I found it all so well done and I just want more of it. Please give me more characters on the ace spectrum, authors! Thanks in advance! Also, let me just say, that wonderful ace rep aside, this story is also so beautifully diverse in so many other ways. Ace rep and diversity aside, there definitely still are so much more amazing things about this book. Like, Tash is such a fun and relatable main character with her own wonderfully developed character, interests (lists, organisation, and classic literature among them) and character growth. She also has the best (like, seriously, THE BEST) friendship with brother-and-sister-duo Paul and Jack ever since they were little kids. Jack is the stoic best friend who’s not good with emotions or talking about feelings, but always ready to speak her truth. And Paul is a huge fluffball who perfectly balances out this little trio. Their friendship felt so real and relatable and I loved every minute of it. Another thing that made this book stand out to me? The big focus on Youtube and well, just the big old WWW in general. It’s been so much fun to kind of get a glimpse ‘behind-the-scenes’ of everything going into the making of a Youtube web series, online popularity and everything that goes with it. We have talk of social media, Tumblr GIF’s, hashtags, ship names, hate comments, vlogging, upload schedules and so on, and it’s all just SO MUCH FUN. Seeing as I have no internet fame to speak of myself, I can’t speak for the rep, but it felt real to me and I did see some booktubers praise its’ great rep, so there’s that. And well, I also just really wish that Unhappy Families was a real webseries because I really want to watch it now! One last thing that this book had going for it, was great family dynamics. Of course, while adapting a story on unhappy families, it would be a pity if it DIDN’T go into a bit more depth into the main characters’ own families. We focus a lot on Tash’s family, and the issues they have, but also the family of Jack and Paul, and I felt that all of this really added to the story. If I would nitpick about this book, I’d say that I wasn’t always a fan of the pacing. I wanted more of some things and less of other things, but those are just really personal nitpicks. Other than that, I can really only rave about this book. I loved it and I already want to reread it. Definitely one of my favorite contemporaries of 2017! 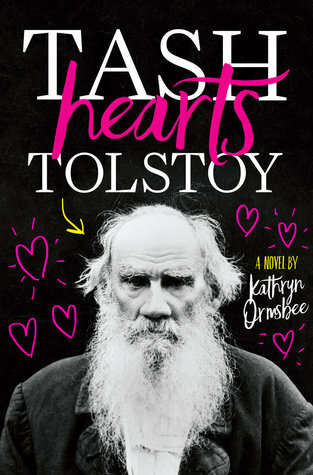 HAVE YOU READ Tash Hearts Tolstoy? WHAT DID YOU THINK ABOUT IT? I’ve heard so many great things about this book so this review is just confirmation that I definitely wanna read this book at some point! Ah so happy this book is on your TBR 🙂 I really hope you’ll enjoy it when you get to it! I can’t believe that this is the first time I’m hearing about this one! It’s sounds really great and this may be the first time I’ve seen romantic ACE rep. I’ll have to look into this one. Brittany recently posted…My Survival Guide for Book Conventions! Yes the romantic ace rep is so underrepresented so I loved it for that, but it also still had so much more going for it 🙂 Hope you’ll love this one if you decide to pick it up!